Sorbus torminalis L. (Crantz) is a rare species in Central European forests with very limited quantitative information on its regeneration and growth dynamics. Since coppicing is no longer practiced in the most parts of Central Europe, it is unclear whether S. torminalis, which has usually a shorter end height than companion species, can persist in high forest systems. Here, we quantified species frequency on three 1 ha sample plots of former oak coppice forest. 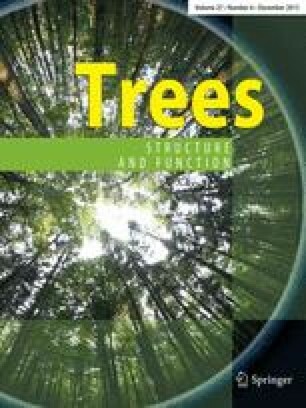 To determine whether S. torminalis regenerated continuously and how it might compete with oaks, the age of 80 trees was determined, and diameter and height growth were reconstructed for the 20 largest trees by stem analysis. To assess its shade tolerance, photosynthesis was measured for leaves located in high and low light conditions. Dendrochronological data demonstrated that, over the last 80 years, continuous recruitment of S. torminalis occurred. Growth patterns and photosynthesis measurements suggest that S. torminalis is a highly shade-tolerant species. We conclude that abandonment of coppicing in these forests does not threaten the status of S. torminalis, which can persist beneath the canopy of oaks. This work has been carried out as part of a larger project funded by Deutsche Bundesstiftung Umwelt (DBU, Project Number 25954-33/0). The authors thank Herbert Kraft, Ralf Dübbers and other members of the Bundesforstbetrieb Rhein-Mosel (Baumholder) for financial and technical assistance during fieldwork and research site establishment. Furthermore, we thank Willy Tegel and Tiemo Kahl for valuable advice during sample preparation and year ring identification. We are grateful to the Chair of Forest Botany, Albert-Ludwigs-University Freiburg, for their technical support with the microscopic analysis of year rings.